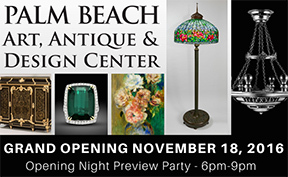 Palm Beach, FL – In November 2016, the Palm Beach Show Group will unveil its newest venture – The Palm Beach Art, Antique & Design Center, a 25,000 square-foot permanent exhibition space located at 500 N. Dixie Highway, Lake Worth, FL. The Palm Beach Art, Antique & Design Center will feature a carefully curated selection of fine art and objects ranging from classical to contemporary and featuring both international and local dealers. The Palm Beach Art, Antique & Design Center will accommodate approximately 40 dealers offering a wide range of fine art, antiques, furniture and decorative objects. The Center will allow dealers to conduct business autonomously or with the help of the Palm Beach Show Group’s staff – a uniquely flexible approach to an aggregate space. The Palm beach Art, Antique & Design Center is a simple solution for galleries who are opposed to opening a second location and being forced to take on additional rent, staff and advertising responsibilities. The building will offer gallery owners the flexibility of having a presence in Palm Beach County without having to leave their current city or residence to reach a new clientele. To enhance relationships with buyers, booths within the Center will be outfitted with cameras so that dealers who are not in the area can Skype via iPad and connect with collectors who are currently in their booths. With an understanding that a Dealer is the best person to sell his or her own items, utilizing technology to connect buyer and seller is the most efficient way to fully augment the current retail environment. The Center will be advertised, marketed and promoted just as all of the Palm Beach Show Group Shows – which are praised for their aggressive and innovative outreach.